Let's earn Money right now Part 1 - And see it's possible for you too - Business meets Emotion - Unleash your full potential! And I am not listening to any music at all. And on with the topic. Let’s earn money right now in 10 easy steps. 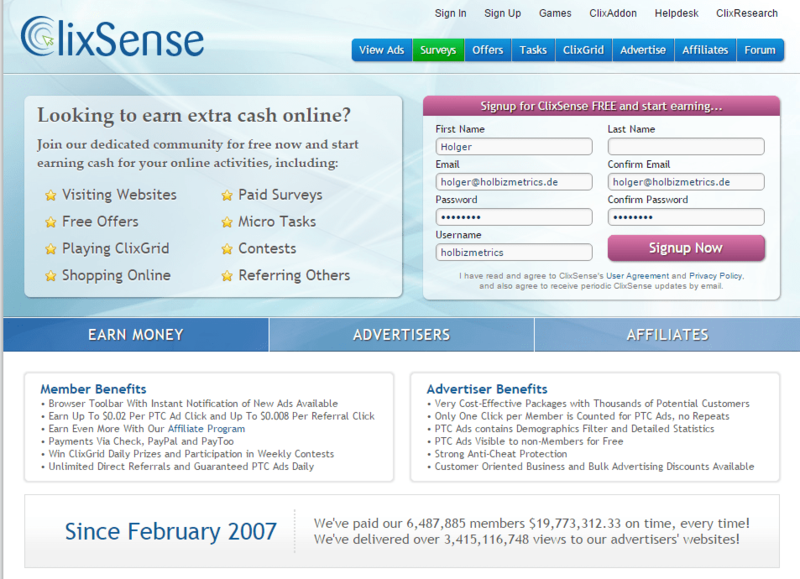 Note: This site will contain referal also known as affiliate links. 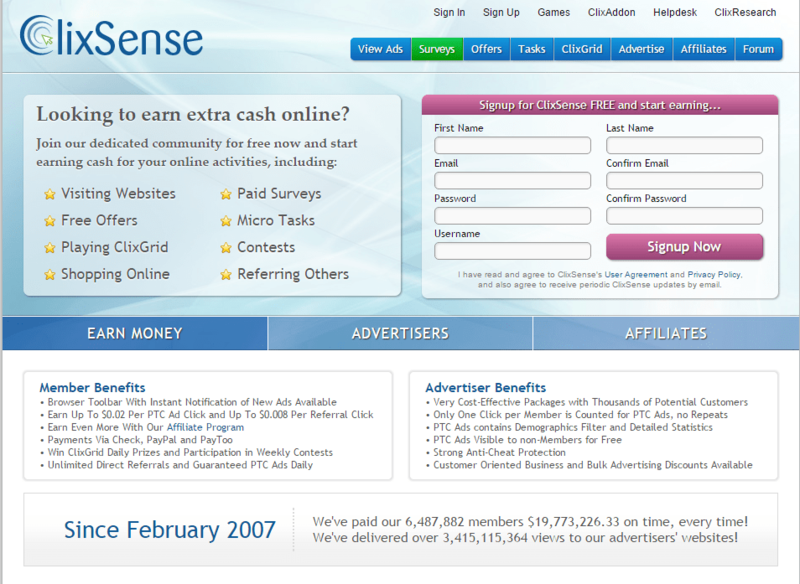 That means, if you use the links I provide here to register using Clixsense, I’ll earn a commission. First we need to get rid of at least the most important blockage in your mind you might not be even aware of. So you need to show yourself that it’s possible for you, too. 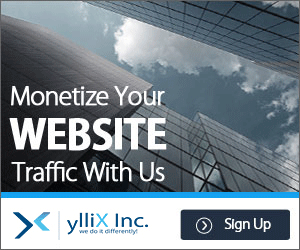 You can actually earn money online. Right now. BUT because it’s right now, don’t expect much. It’s in the some cents to dollar range. I definitely don’t like it much, when I go to a tutorial where there is some things told and suddenly you notice, oh my God! You can’t go on. Because this or that is missing. I will only refer here to Paypal because I don’t know or have the other ones yet. Endurance, you’ll need it, definitely. You see, not only technical skills are involved, you need also learn to master your emotions. This time I can’t help you out a lot at first. So you have to commit to going through with me. Are you willing to do this? Good! It’s serious. It’s not easy, but it’s real. We need a plan. What to do. And HOW to do it. 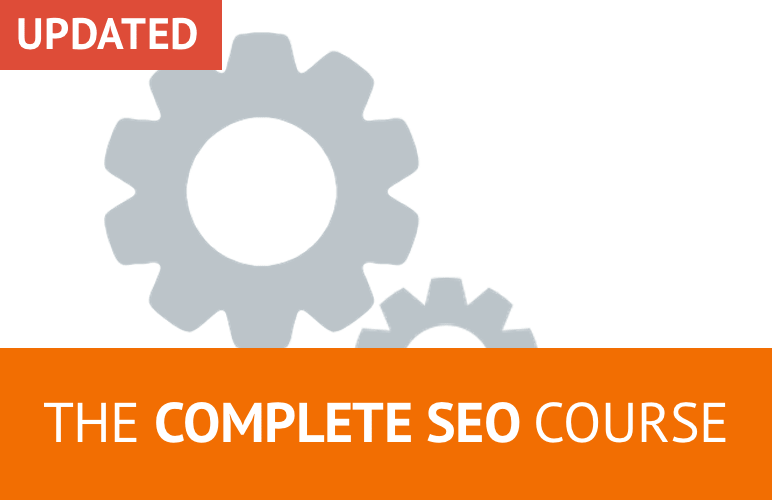 Is this a completely new world for you, dealing with an online business? Good! Not new? You already have a successful online business ready and running? Then this still might be the place to go, to see if you got any mental blocks OR you can give me tips. Both are appreciated. Because I’m always willing to learn. This money we will earn right away, will NOT be through our website yet. Because this would be really incredibly fast. Any site promising this may be proved wrong. But I am willing to change my mind if I see a relatable real generous method. And then I will for sure introduce it to you here. Why is it so important for me to show this to you, how to set something up and making it work for you? Because when you just start, you might not even think it is possible for you to earn money online. You want to feed your brain with some positive reference experiences. Ever tried to think yourself into confidence? It doesn’t work that way. There are all types of mental and emotional blockages you have to deal with. And I’ll tell again: And you might not even have been aware of them. So you and me, we need to get out of our own way to get this up and running! Are you ready? Ok. Let’s go. Often we are afraid if we don’t know what we’re up against. Did you even see that the sentence above could contain a limiting belief? We will investigate this more deeply in another article. 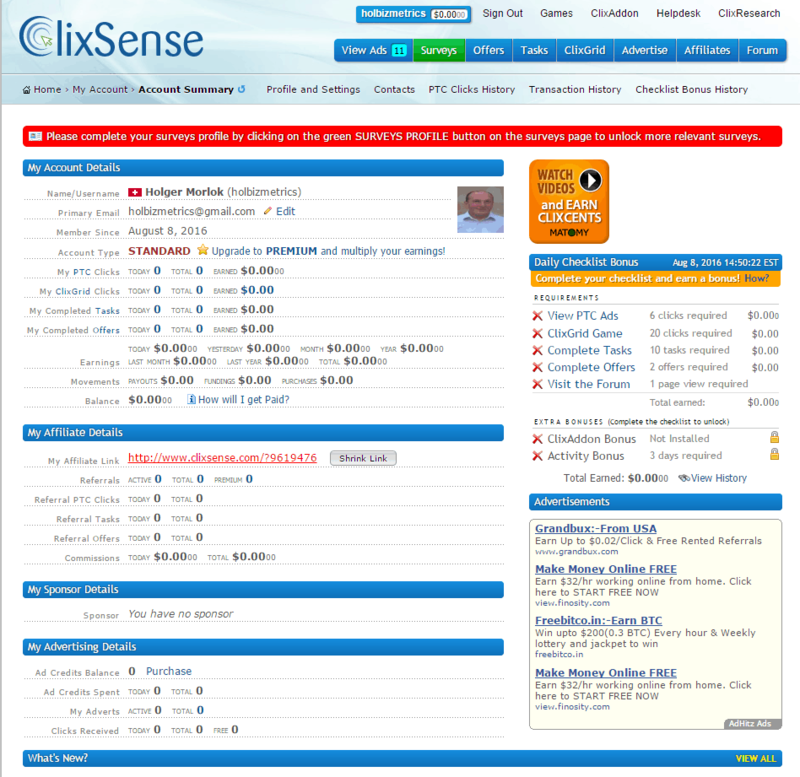 Clixsense is a PTC site. First, we will navigate to the home screen. It might look like this or a little bit different. Depending on your device or the screen you get. Why did I choose this external page to start? Well, because it is comparably easy to set up. And you WILL definitely get some money. Pronto! This is crucial to see for your brain THAT it is POSSIBLE for you to earn money online. No matter if you believe it right now or not. Don’t be irritated if it looks like the screenshot below or different. It might be dependant of who gave you that link, when you access the page, sometimes even country dependant. 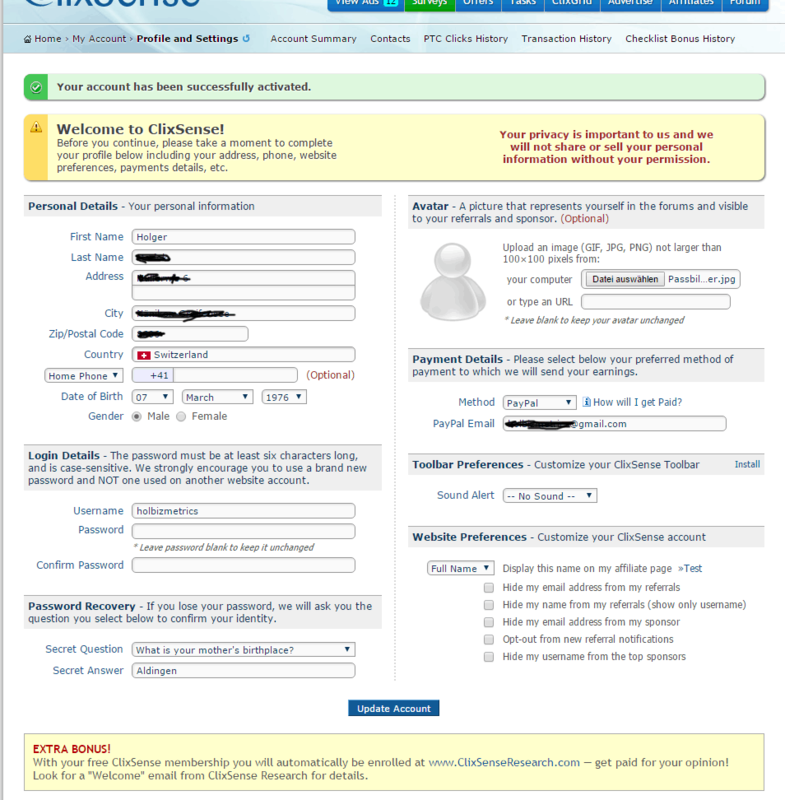 In the screenshot below, at the right, you can see how I filled up the Signup Now part of the form. Just fill in the needed data in and then click the red-ish button containing the text Signup Now. Make sure you remember your account name and your password. Hint: I left the Last Name blank which is also mandatory to fill in. If you don’t do it here, you will have to fill it up on the next screen. When you have done this, you will get a validation E-Mail, pointing to a link. Click the link to validate your account. 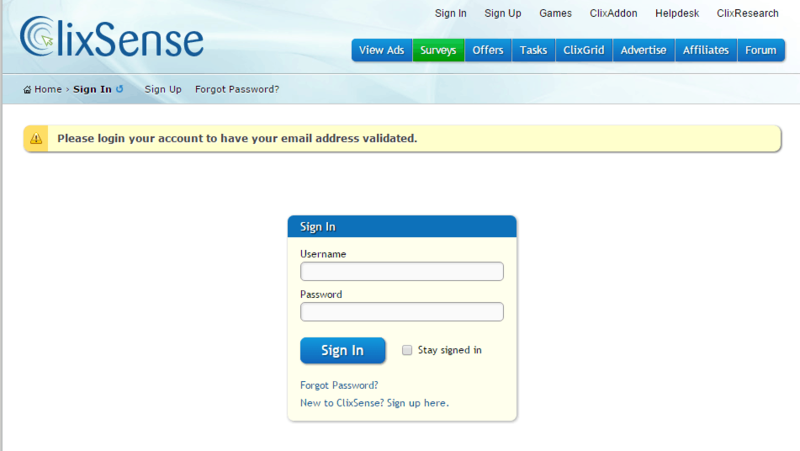 This is all you have to do first to get into your Clixsense account. 4. 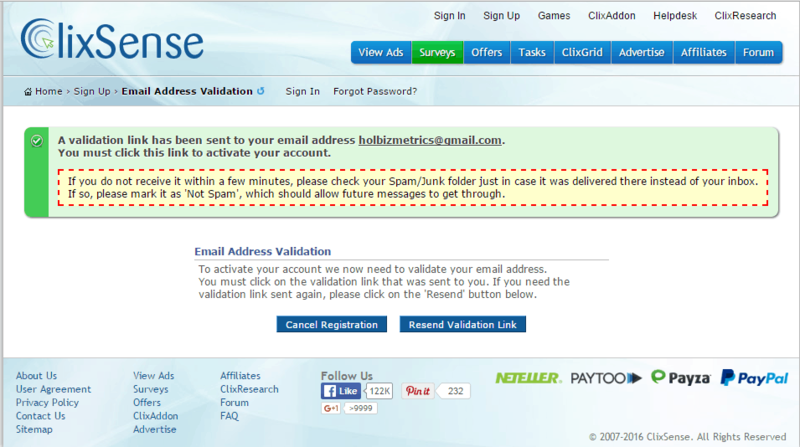 Please log in your account to have your email address validated. Ok. So let’s do this as well. Login to your account. Now you need the Username and Password I advised you to remember in 2. Let’s do a little check. Do you feel any nervousness? Many people would now advise you to NOT FEEL STRESSED. Like telling you: Oh you don’t have to be stressed. I guess you can’t just suddenly switch off your stress or anxiety or anything you might feel right now. Especially not if someone tells you to so if it has been the way it is right now for years. Not in a second. Yes. We switch them off. Seemingly. By suppression or repression. Sit with your emotion. Don’t suppress it. Don’t repress it. Just let it sink in. And do it WHILE FEELING THAT EMOTION. Ok. Can we go on? Good. Then log in. Put your Username and Password into the screen below. And Click the blue Sign In button. Yes. You maybe won’t believe it. We are almost already done. This only means still that you have to click the link to validate in step 3. So if not already happened click it now and follow through. write it please into to the comments and I we figure out a solution. Together. Collaborative. Below you see some of the most crucial parts you have to fill in now. If you have all put in and you are satisfying the condition and satisfied yourself press Update Account. I’ve just smeared the details of my really chosen emails and stuff here. Put your account data into the fields. Only the fields marked with an (Optional) you don’t have to fill in. Pretty self-explanatory. Don’t fake the data here. Because in my opinion, it’s crucial for your “Pay-Check” here. Here is nothing for you to do at the moment. But it might be important to know. If you don’t want to read that now skip and continue executing step 8. 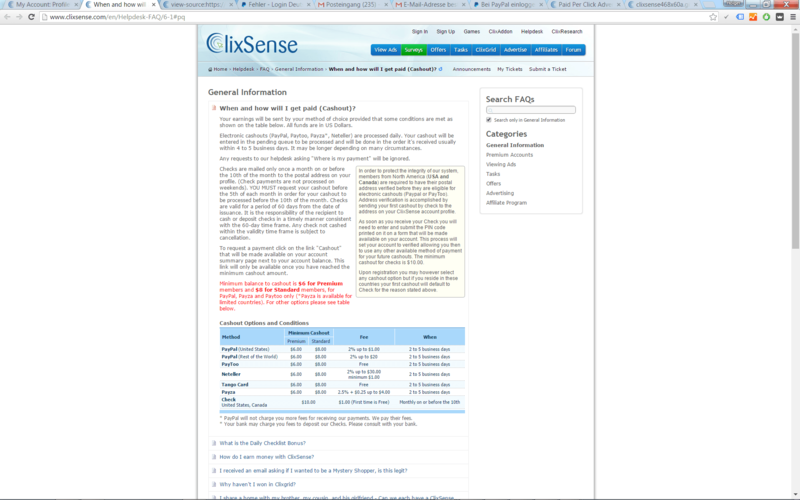 For people that need to be sure or want more information, I added the paying information as stated by Clixsense. This can change. Because I just made a screenshot. 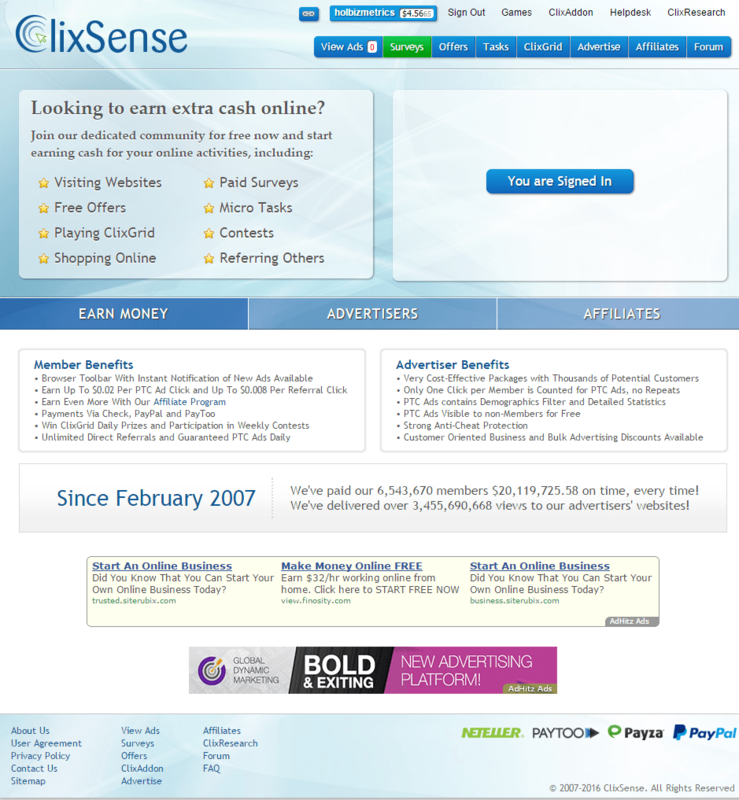 Clixsense – How will I get paid? to get paid for the first time. 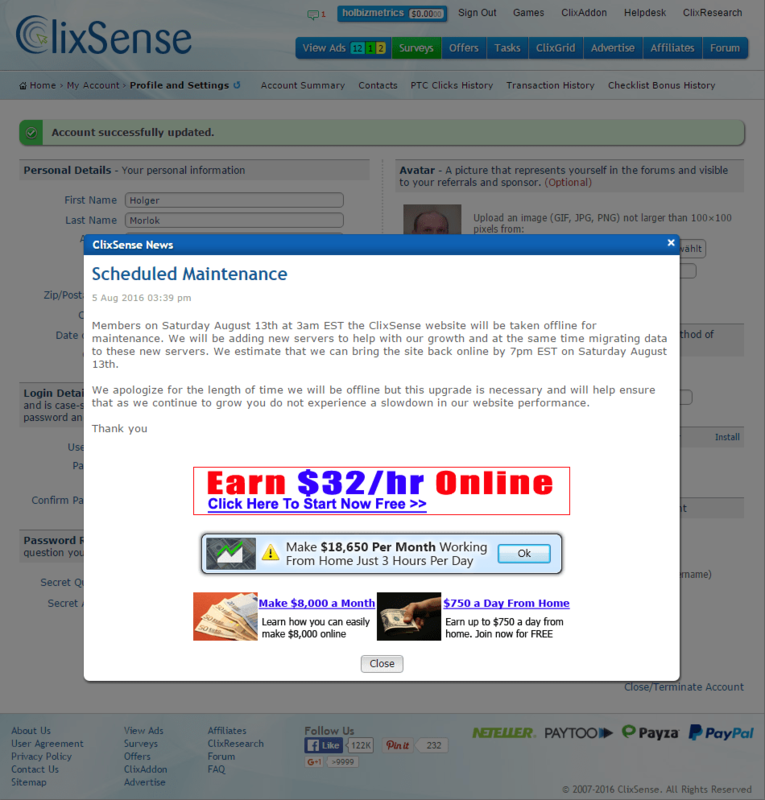 This means when you earned a total of 8$ you can withdraw it from Clixsense and it goes directly to your paypal account. You are signed up, logged in. And are presented with something like a nag screen. This might change from time to time. If you take a closer look by just reading the text you see, it’s not really a nag screen. It’s just an information about actualizations of the site that may occur. Finally you can start earning money. But how? What to do next? Now you got a virginal account which shows you, that you have not earned anything. followed by two gray 00. Yes. You can also earn less than a cent here. And you see that in the title bar the View Ads button shows a count of 11 here. That means you can view 11 Ads, click on them, wait until they are finished and then you got your first money. I searched immediately for an ad on that site, that would give me at least 0.01$. I found it and I clicked it. Then another window will open. Stating: Click on the cat. Why is that? That is to make secure that no automatic programs will click the pics, which this company does not want. Because they pay real money for people watching their ads. Normally this means to wait for up to a maximum of 30 seconds. The screen has to be open and to be focused. Otherwise, the timer will stop. If possible you can use your second computer or a virtual machine to do this. All following below now is optional. You don’t have to do it. But for sure you can. 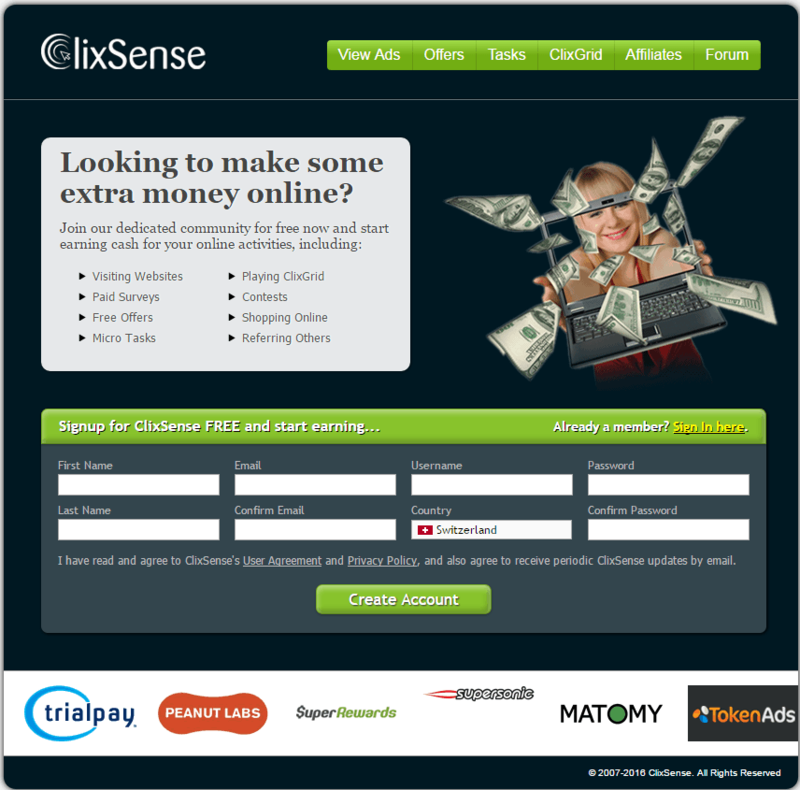 You can now click on the different tabs like Surveys, Offers, Tasks, Clixgrid or use Affiliates to earn more. I think I will update this article tomorrow, so you see how to get more benefit from that. After explaining all I think is necessary to get your first 8$ to be paid, I will go on with the next article. For each day that you complete your Daily Checklist, a bonus will be added to your account balance at the end of that day. Premium members will earn a bonus of up to 16.0% of their personal earnings, while Standard members will earn a bonus of up to 7.0%. The bonus amount you can earn is unlimited; it only depends on your activity. This bonus will be calculated from your total personal earnings that include your PTC Ads clicks, ClixGrid prizes, completed CrowdFlower Tasks and completed Offers and Surveys. Other bonuses and referral commissions are not included. Visit at least one page of our forum. Posting is not required. ¹ ClixAddon Extra Bonus: Complete the checklist and run the ClixAddon for at least one hour in a given day to earn this extra bonus. Important: Survey notifications must be enabled under options. * Regarding the Tasks, Surveys and Offers, if for some reason you do not get credit for completing them on a given day, or if payment is delayed into a following day, the checklist of that day will not take them into consideration; payments are not retroactive, they will instead count only towards the day when they are actually received. That it is possible and it’s not as scary and pointless as you might have thought. That you’re still alive. Aren’t you? Hello? Helllooooo? (just kidding). Now the account is setup earning; earning more money is now much faster. If you can manage to get referrals you can already earn your first passive income. Did you notice what happened so far? If you now think differently you got achieved a lot more than just earning one lousy cent. You changed your belief! You can earn something online. Please shoot me your comments, where you need more help or if you didn’t understand anything. If you liked this article and found it helpful, please share the information. 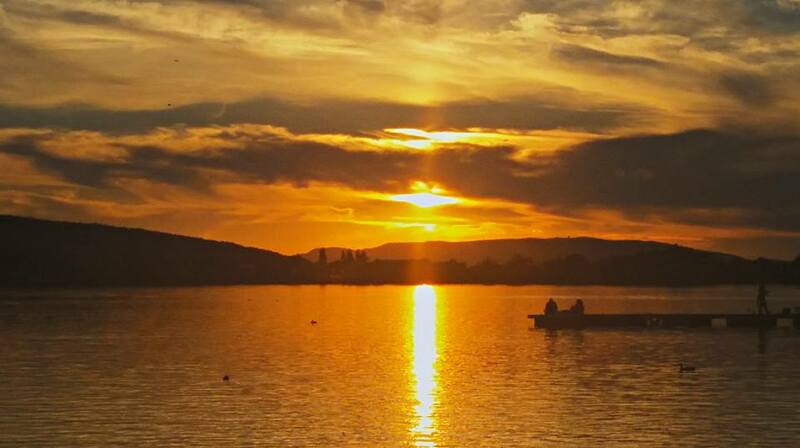 I wish you a good day, evening or morning. Wherever you are.